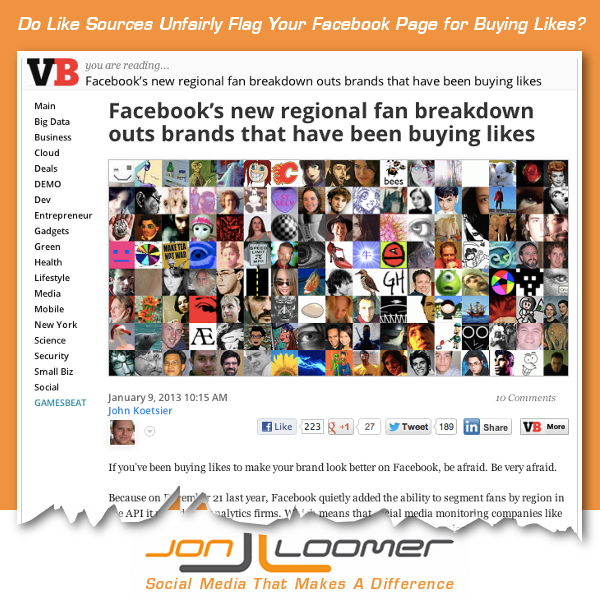 Do Like Sources Unfairly Flag Your Facebook Page for Buying Likes? If you’ve been buying likes to make your brand look better on Facebook, be afraid. Be very afraid. I was immediately intrigued. Maybe a tool was created that was able to track down a common thread between every fake profile. This could be interesting. Because on December 21 last year, Facebook quietly added the ability to segment fans by region in the API it provides to analytics firms. Which means that social media monitoring companies like Socialbakers are finding all kinds of juicy oddities in the fan counts of major brands. In other words, the breakdown of likes by country is now public knowledge. Seriously? That’s it? That’s how we’re going to determine whether someone is buying likes? Which isn’t exactly proof of fraudulent behavior or buying of fans. But it is a little suspicious. Let me repeat: The headline of this article was “Facebook’s new regional fan breakdown outs brands that have been buying likes.” How can something both out someone and not “exactly be proof of fraudulent behavior or buying of fans”? Unfortunately, many will miss the caveat and begin pointing fingers based on geographic breakdown. But that’s a dangerous approach, and one that may bite you in the end. I want to nail those who buy and sell likes as much as the next guy, but the assumptions that may be made here are careless and dangerous. 1. What defines a suspicious country? One that isn’t the United States? One that simply isn’t considered within the brand’s territory? Are fake accounts only from certain countries? Have these “buy likes” services seriously never considered setting up accounts in the US and “less suspicious” countries? Let’s assume for a moment that all of the fake accounts are cornered in specific countries. Is buying those likes the only way that a page could end up with them? I’ll answer that question for you: No freaking way. 2. How many is too many? Surely it’s feasible that a page could have likes from “suspicious” countries in small quantities. But how many is too many? Do we go by totals or percentages? Remember that fake profiles are out there for reasons other than as a like purchase. Spammers also use them. So think about this from the point of view of spammers. If you set up accounts for the purpose of spreading your links all over the internet, would you like a page with 50 likes or 50,000? A reasonable expectation would be that the more popular pages would be targets since spamming those comments would reach more people. If your page is a magnet for spam bots, would that not trigger unfair suspicions? According to this logic it would. 4. What about like bots? This is a topic that gets very little coverage, so the facts aren’t entirely clear. But I’ve heard stories of “buy likes” services setting up fake accounts and liking pages randomly (not only those of customers) so as not to follow a pattern that could raise suspicions. As a result, most page admins have noticed what appear to be fake profiles that are liking their pages, often through ads. But some aren’t even buying ads. And what about those ads? Anyone who has experimented significantly with Facebook ads knows about the curious results you may see if you’re not careful. It’s exactly why I wrote this blog post about how you should avoid using Optimized CPM. It’s also why I wrote this post about work-arounds for Promoted Posts to avoid the bot and spam problem. This has me a bit hot because I know that virtually anyone could be hit with accusations based on this logic. Even me. Should Brazil really be the second biggest source of likes for my page? Combined with Portugal, that’s two countries in the top eight that speak Portuguese instead of English as a primary language. India fifth? Philippines seventh? But again, what is considered “suspicious?” Isn’t there a certain level of profiling going on here? I know that when I ran those Optimized CPM ads when they first came out, I was getting insane results. And it wasn’t until I racked up 800 new likes that I realized many appeared to be fake accounts. I spotted this, of course, and made adjustments to avoid it going forward. But this likely isn’t true of many brands. Spotting irregular numbers could be a sign of advertising gone wrong, but it’s not necessarily proof of buying likes. What is Your Geographic Like Breakdown? After reading this article, I’m actually a bit curious about VentureBeat’s concentration of likes from “suspicious” countries. Not because I think they did anything wrong, but because you’d better have some pristine numbers yourself if you’re going to suggest this connection. How about you? What is your geographic like breakdown? Might someone mistake yours as a page that may have purchased likes?